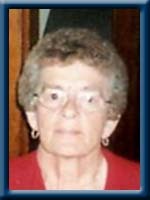 HIRTLE – Shirley Elizabeth 73, of Caledonia, Queens County, died peacefully at Queens General Hospital, Liverpool on February 25th, 2013 with family by her side. Born in Liverpool, December 6th, 1939, she was a daughter of the late Stanley and Ruth (Anthony) Wamboldt. Shirley loved knitting, walking and her puzzle books. She will be fondly remembered as a loving wife, mother and grandmother. She is survived by her husband Berlyn, daughter Ann (Perry) Potter of Milton and grandson Logan as well as numerous sisters and brothers. She was predeceased by two infant sisters and a brother. Ann, I am so sorry to hear this news, …She was a sweet lady, and always liked having a chat with her. Hugs to you and the family, my deepest sympathy..
Berlyn I was so sorry to hear about Shirley’s passing. I know it will be hard on you but rest assured knowing she has gone to a much better place with no more suffering. The hurt and loneliness will ease with time but we will never forget our loved ones and should be thankful for the wonderful time we’ve been allowed to have with them in this life. My thoughts and prayers will be with you every day. Dear Ann, I am so sorry for your loss, please accept my sincere sympathy at this sad time. Shirley will be missed. A little lady with a big heart. Always so compassionate- we will never forget her. Anne, so sorry to read about your Mom’s passing. Please accept our deepest sympathy. Our thoughts and prayers are with you at this difficult time. berlyn and ann sorry for ur lose.she was a great wife and mother and a great sister.i will rem.her she was a outgoing person .always rember and sadly missed. I will sure miss you auntie love from scott me and kids xoxo thinking of you guys ann berlyn and family. So sorry to of the loss of your Love one. Our Sincere Condolences at this very difficult time. RIP Shirley…. So sorry Berlyn and Anne. Sorry we can’t be there for you but we will see you this summer. Anne and Berlyne not right now but the days will get easier as you go along we love you both and again so sorry for your loss. So sorry to here of your loss. Our prayers and thoughts are with you in your time of sorrow. Our deepest symapthy in the passing of Shirley. Our thoughts our with all of her family. My thoughts and prayers go out to your family in this time of sadness. Our deepest sympathy to the family.Our thoughts go to Logan ,and thinking of you at this sad time. Deepest sympathy to Berlyn, Ann & Logan. I will cherish the memories of th good chats we had while doing her hair. Shirley & I shared the same B’day, she was 10yrs. older than me. She always would remind me of our B’day. I will miss Shirley as a friend & as a customer. Ann so sorry to hear of your moms passing our thoughts and prayers are with u all at this sad and difficult time . Ann: I am so very sorry to hear of your mother’s passing. My Sincere condolences. So sorry to hear of Shirley passing .My deepest sympathies go to the family . Shirley and I went to school togather . .Just lost touch over the years . Again sorry for you loss . Berlyn I just read of your loss I am so sorry for you and Ann and the family. I know how much you will miss her, she was a great person. Ann, Father and Son, Condolences to all of you. I had the pleasure of meeting your mom and she was a very sweet lady. God bless all of you during this great loss. Please accept our sincere sympathy. I know you all adored Shirley and she was so proud of Ann and Logan. Enjoy your happy memories.